Are you looking for somewhere to complete your HGV licence training? Then look no further than Wayside Transport. We offer comprehensive DVSA accredited driving lessons with highly-trained instructors so that you can become a safe and competent HGV driver. With pass rates above the national average, we can provide you with the best tuition for your HGV training. An HGV driving licence is also commonly referred to as the rigid 2, or LGV licence and training is open to those who passed their test after 2007 and now want to become qualified to drive a heavy goods vehicle of over 3,500kg. The team at Wayside Transport will walk you through every step of the process including providing you with the D2 and D4 forms you need, and we can even recommend a doctor for your physical. You’ll then receive your provisional licence and we can begin your official training with one of our expert instructors. They will assess your driving initially to be able to tailor your lessons to your ability and learning style. To take a look at all the official steps you need to take before you start, click on our LGV training page now. 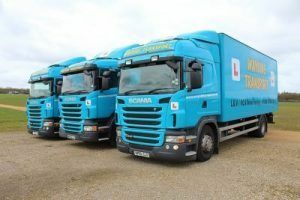 Depending on the type of training you require, we can offer a number of different lessons to help you qualify to drive a HGV/LGV. 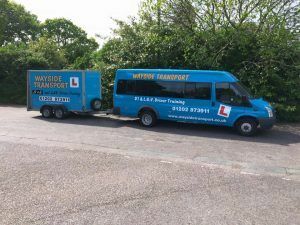 If you are a company taking on new employees and want them to have the best training, then send them to Wayside Transport for the most rigorous HGV licence training that will make them the best drivers for your business. We can train up members of your team to assessor level, which means that they will have the skills and knowledge to manage and review the quality of driving amongst your fleet. Having a designated assessor for your drivers will ensure that their training stays fresh in their minds and is updated with the latest safety regulations. By investing in assessor training, you can ensure the safety of your fleet, reducing accidents and the cost of insurance. Our training courses are open to any individual wanting to increase their driving skills or have a change of career. Being a HGV driver is becoming a popular career choice with salaries of up to £30k per year. Drivers are currently in high demand so if you are considering a career change but not sure whether to go for it, take our HGV licence training and gain the experience you need to make the right decision. If you’re already a qualified HGV/LGV driver then why not use your skills to help others? We also offer HGV licence training for you to become an instructor yourself. Our instructor courses are taught one-to-one over a 10 day period before you take the instructional ability test. Our expert tutors will provide you with all the knowledge you need to become a competent and successful HGV driving instructor. All of our instructors are DVLA certified and are passionate about providing the best HGV licence training in the South of England. We have training and test centres in Southampton and Poole, or if you’re further away we will be happy to find a test centre closer to you. We want to ensure you are confident with your driving ability which is why we tailor each lesson to your needs and your instructor will always provide honest and impartial advice so that you can gain the most knowledge and experience as possible during your lessons with us. All of our training courses are designed to give your organisation the highest standard in the most cost-effective and time-efficient way. You can rest assured you are getting the best tuition with our expert team of instructors who are passionate about teaching. We will work with you until you feel competent and confident enough to take your test. To see what some of our learners have to say about our licence training courses, view our testimonials. If you are not sure what HGV licence training course is right for you, then get in touch with one of our expert team to discuss your options. We can help you decide what course is right for you so that you make the most of your lessons. For the best HGV licence training, get in touch with Wayside Transport today. Call us on 01202 873 911.